After claiming his seventh consecutive win as a UFC featherweight over Charles Oliveira in Saskatoon last night, young Hawaiian Max Holloway showcased his business mind as he pushed for bouts with Frankie Edgar and Conor McGregor. ‘Blessed’ also pitched the idea of UFC holding a stadium event in Hawaii, highlighting a new savvy for the 23-year-old when it comes to the marketing aspect of the game. The win was slightly underwhelming after such a strong start from Holloway. Once again, the striking assault of the rangy featherweight seemed to be too much for Charles Oliveira to take. Holloway constantly moved in and out of the pocket and connected with clean shots. His focus on the body of ‘do Bronx’ kept the Brazilian on the back foot as Holloway went from strength to strength. Oliveira looked to take the fight to the deck midway through the first round, but on failing to pull Holloway into his guard he stood up and gestured to his left shoulder. The injury was confirmed today as a micro tear in Oliveira’s esophagus. Although Holloway tried to close the distance on his struggling opponent to land more shots to his abdomen, Herb Dean stepped in to stop the action between the two 145 lbs prospects. Certainly, it wasn’t the finality that fans and media were looking for when it comes to a showdown with definite title implications. Regardless of that, Holloway took his opportunity to play matchmaker with the eyes of the MMA world on him in his post-fight address, after first voicing his concern for his fallen counterpart. 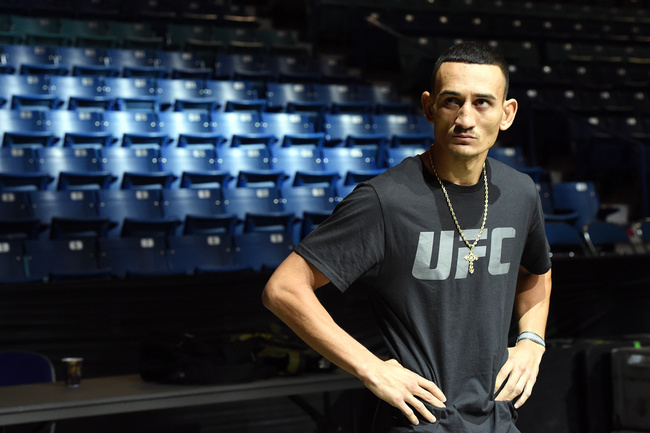 When asked about prospective matchups for his next Octagon outing, Holloway declared an interest in a bout with Frankie Edgar, a man who many feel has been held back from a rematch with champion Jose Aldo. While many other featherweights lock their attention on Conor McGregor of late, it was quite clever of the 23-year-old to look to ‘The Answer’, given that the winner of a bout between them would nearly guarantee a shot at the champion after the unification bout at UFC 194. The ‘Blessed’ one seems hell-bent on attempting to fill the big boots of legendary Hall of Famer and fellow Hawaiian BJ Penn. His aggressive style, his pride in his upbringing and his success have certainly made him a fan favorite in Hawaii, so much so that Holloway seems very confident that he could fill a stadium in his homeland. Again, a stadium show in Hawaii would nearly guarantee a big payday for ‘Blessed’, and at the post-fight press conference he alluded to UFC putting a big show on in his homeland. Although he didn’t put Conor McGregor to the forefront of his plans, he did make positive sounds when it came to a rematch with ‘The Notorious’—the Irishman has previously alluded to himself as “the money fight” in terms of mixed martial arts. “I would fight him any day of the week,” said Holloway on the interim featherweight champion. “Now that I don’t have a fight I can talk how I feel, I will fight him any day of the week. UFC could have called me for the last one (UFC 189) and I would have (taken) him. They didn’t, they choose Chad, but I would love to fight him. Although it was Holloway’s first time in the main event slot for UFC last night, his performance certainly didn’t seem to be affected by the added pressure. The featherweight alluded to his comfort with top billing in the post-fight press conference, which is another factor that will play into his success should he continue to hold down a place at the top of the division. He said: “I felt great. If I’m fighting on the first fight of the card, or anything, any place on the card – it doesn’t matter. It felt good and kind of crazy doing the opposite side walkout, but that was about it. This new awareness of the business aspect of the sport that Holloway has shown since his win over Cub Swanson will certainly help him throughout his MMA career. Right now the Hawaiian is saying the right things, and more importantly, putting in the performances that have marked him out as a potential future champion.